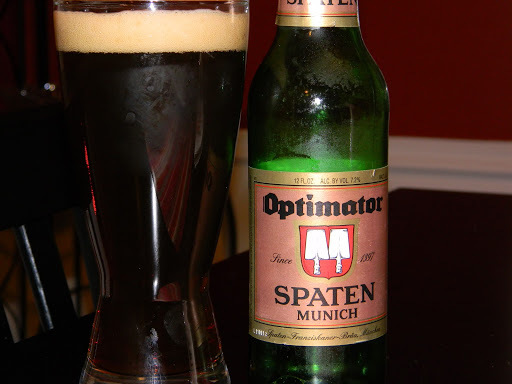 Review of Spaten Munich Optimator | Beer Apprentice - Craft Beer News, Reviews, Interviews and Info. Tonight’s review is of a beer that seems to get high praise from most beer connoisseurs. It’s the Spaten Munich Optimator from Munich, Germany. It’s a German Doppel Bock, of which I have not tried too many of. I found some information about the brew from their website, spatenusa.com. A classic German beer, bottom fermented “Doppel Bock.” Full bodied with a deep, dark color and rich, roasted, malt flavor. Well… not much info there, so let’s see for ourselves. This beer had an ABV of 7.2% and came in a 12 oz. bottle. After pouring this beer it appeared a dark brown, almost maroon-ish color with some ruby highlights when held to the light, but it also had some burnt orange and yellow color tones around the bottom and sides of the glass. The head was an off white color with only average size and retention. It did settle to a decent film across the top and left some pretty good lacing on the glass. In the aroma, I picked up a dark, earthy, almost burnt grass or grain quality. Not particularly the most pleasant smell I’ve ever encountered, but I got used to it after a few minutes. This aroma started to remind me of a more robust Dunkel the longer I let it warm and develop. The taste was reminiscent of a “black” lager. Very dark, robust, earthy malts that started to reveal hints of lard with the previously mentioned burnt grain. Just a touch of sweetness, but it is so well hidden and pushed to the background that I had trouble determining what it consisted of. To top it off, I got a slight hint of alcohol at the very end of the drink. The mouthfeel was medium and relatively smooth, but it was just a wee bit watery. It did leave an adequate amount of flavor covering the palate however. Overall, I think this beer would take some getting used to for me. It’s nothing really bad per say. It’s just different and somewhat off putting. Maybe my palate is just not accustomed to this type of brew. I have noticed that most Bocks and Doppel Bocks that I have tried do not leave me wanting another bottle. I personally don’t think I could make a night of it. It’s just not my “thing.” On a positive note, I do like the look and color of this beer. I’m sure some might find it enjoyabe and tasty, but I can’t see myself wanting to pick this up and give it another try for a very long time.